Ögussa - Fairmined. Gold to be proud of. Fairmined. Gold to be proud of. The Austrian Gold and Silver Refinery Oegussa hast been the most important supplier to Austria's jewelry producers for more than 150 years but never stood still. That applies regarding technology as well as regarding its responsibility towards the community and our environment. Since 2015, Oegussa is "RCJ Chain of Custody" certified for its 100% Recycled Materials and ensures physical traceability of its conflict-free materials by accredited third party audits of the chain of supply. RJC stands for the non-profit-oriented Responsible Jewelry Council headquartered in London. In practice, this implies a strict commitment to ethical, socially and environmentally responsible standards that are regulated with a multitude of measures laid down in the "Code of Practice" of the RJC. The RJC has 700 members worldwide of which 31 passed the strict Chain of Custody-certification of their precious metals. "The majority of Oegussa's precious metals originate from own recycling of scrap metal from European sources. This Urban Mining is resource-conserving and by far superior to any kind of mined material when it comes to social standards and environmental impact", clarifies Marcus Fasching, CEO of Oegussa. Oegussa therefore does on principle not accept mine material, and only makes an exception for materials from Fairtrade and Fairmined sources due to social responsibility. Artisanal mining employs 90 % of the workforce behind gold extraction and is responsible for 10 % of global mine production. 10 million people depend on artisanal mining to make a living. To ensure and a fair and responsible chain of delivery also for the current gold mining and to enable a positive development for mining communities in emerging and developing countries, Oegussa since February 2016 offers Fairmined Gold to its industrial customers as Authorized Operator AT20012. 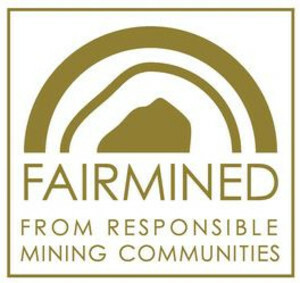 Fairmined Gold is certified gold originating from responsible artisanal and small-scale mining, currently from mines in Peru, Colombia and Mongolia. It is mined, processed and traded according to the "Fairmined Standard" developed by the Alliance for Responsible Mining (ARM). This standard promotes social development and environmental protection in artisanal and small-scale mining. Once certified, responsible artisanal mines get a minimum price and a fairmined premium for their minerals. By paying this premium, gold and jewelry buyers actively contribute to an improvement of living and working condition of miner's families.